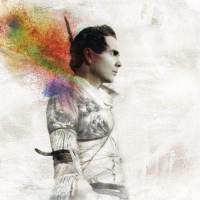 Like the splash of color that brightens it's otherwise drab charcoal cover, so stands the music on Jon Thor Birgisson a.k.a Jonsi's first proper solo effort Go in comparison to his work with his primary band, the beloved indie Icelandic outfit Sigur Ros. For those unfamiliar with either Sigur Ros or Jonsi, all conversations have to start with his unbelievable voice. There are good singers, there are great singers, and then every once in a while, there are vocal miracles. That's Jonsi, possessed of an utterly unique male soprano so high and powerful and clean and emotive that if we'd all been living a couple of centuries ago most would suspect childhood castration as the cause. For near fifteen years now, Jonsi and Sigur Ros have been applying that voice to all manner of lengthy, intimate, sonically stunning, epic ballads, never varying the formula much until traces of a poppier approach began showing up in 2005 release Takk and then even more noticeably with 2008 release Med Sud I Eyrun Vid Spilum Endalaust 's opener Gobbledigook . Go is the sound of Jonsi taking those pop ideas and finally committing to them full bore. Like the work of Japanese bedroom popper Shugo Tokumaru (but better), five of Go's nine tracks explode in a kaleidoscopic particulation of upbeat, instrumental color. Quite literally, on tracks like Go Do , Around Us , and album peak Boy Lilikoi , one feels like one has just been hit dead on by a happy-sound cluster bomb. Needless to say, despite the sometime unusual arrangements and progressions, this album is easy on the ears. The remaining four tracks...particularly the fine ballad Tornado and the mere surge of mood Grow Till Tall ... hearken back to the more traditional Sigur Ros sound, but it's the poppier numbers that make the strongest impression. My only criticism with this record, but it's a significant one, is that it's a bit of Chinese dinner...it sounds great going down, but as soon as it's over, I've almost instantly forgotten it.. Despite this complaint, still a solid recommend for the average listener here, with a more enthusiastic recommend for those who are already fans. Though not quite as good as most Sigur Ros records, I think you'll find this a significant step up from Med Sud I Eyrun Vid Spilum Endalaust . Cherry Picker's Best Bets: Go Do , Boy Lilikoi , Around Us , Grow Till Tall .